A Special Economic Zone (SEZ) has been proposed at Therovy Kandigai village in the Thiruvallur district of Tamil Nadu. The Village is located about 50 km northwest of Chennai the capital of Tamil Nadu . The total population of the village is approximately 5,000. Most of them belong to Schedule Tribe and other so called backward classes. State Industries Promotion Corporation of Tamil Nadu (SIPCOT) has acquired 1,127 acres of land in the village to establish a SEZ . Acquired land of the village is a common grazing land used by villagers since long to rare their cattle, called 'meikkal poromboke' (wasteland). They also earn their livelihood from the forest products; especially in times of drought, when rice had become expensive, the villagers resorted to wild fruits and spinach that grew in the forest. For centuries, people are depended on the forest to graze livestock, fruits, herbs and firewood. So, it was a community responsibility to protect the forest which serves their purpose for long. The Thervoy forest is also of utmost importance for the local ecosystem as it's an important water catchment area. The villagers as well as anti-SEZ activists have been protesting against this forceful acquisition of common land for years. The villagers are afraid that a stream of fresh water that flows from the forest through the grazing land will be blocked. The blockage of this stream will have serious consequence on irrigation and grazing of herds. Also, due to the construction in the SEZ, lots of trees have been cut and the area is fenced, the channel is blocked. This reduced the flow of stream also one lake in the area has been filled with excavated soil [1,2,3]. 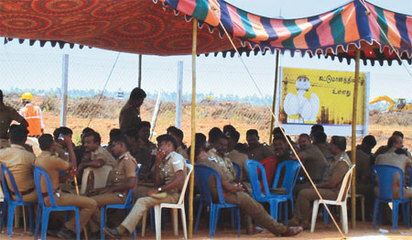 Since 2007 when the project was conceptualized, the villagers filed their protest to the concerned district officials, police, elected representatives, and SIPCOT several times. They staged protests and sit in for hunger strikes. Three thousand of them fasted in front of the Collector's office, who later showed solidarity with the mobilizers . However, no attentions are paid by the concerned authorities and SIPCOT. Their peaceful movements are oppressed by the polices as well as district administration . In 2008 the protest scaled up after the announcement of the French company Michelin's plan to open a tyres factory. Local residents and farmers fear such facility will pollute the waters and put a risk the surrounding forests. Other companies which will likely build in the complex are Aluminium and Ferrous Alloy Metal Maker Hunter Dougles India Private Limited, Harsha Float Glass and Harsh Exito Engineering Company. In 2009 large mobilizations occured against the land acquisition, 61 villagers were arrested and jailed for protesting. Legal actions have been taken against the SEZ; on May 12, 2009 a stay order was issued by the high court (WP 9319/2009). Judges Jyothimani and Sivagnanam ordered for a stay of demolitions for three months, but not a permanent stop to the SIPCOT industrial park and industries proposed. On 15-9-2009 The Gram Sabha of Thervoy Panchayat passed a resolution opposing the establishment of SIPCOT industrial parkresolution stating that they wanted they withdrawal of the establishment of SIPCOT Industrial park. In September, 2010 Professor Lakshmanan , Associate Professor, Madras Institute of Development Studies completed a useful study “Environment and Social Impact Study of the Implementation of an industrial Zone: Thervoy village of Tamil Nadu ”, which confirmed mobilizers' concerns. In October 2010 an awareness padayatra was organized to 18 villages. Talks were held on the consequences to life and livelihood if the SIPCOT industrial park with the proposed industries is established. 400 people (150 women) took part in this padayatra, which spanned 32 kilometers. From 16/2/2011 to 22/2/2011 hunger fast was held by 3000 women and men demanding the immediate closure of SIPCOT industrial park and the concerned industries. In that same year, even false propaganda by Michellin Tyre company was put in place by an NGO but local mobilizers found that out and chased those guys out of the area. In August 2010, the project was approved by the Ministry of Environment and Forest in condition that the project work should begin only after getting clearance from the state pollution control board. Villagers as well as activists claim that the construction began before the required approval from the State Pollution Control Board. The government has given a go-ahead to the SIPCOT project despite opposition at the public hearing . Development of Alternatives Activists say that SIPCOT has acquired the land without the consent of the villagers. So they demand the industrial park should stop all construction activities and should be closed . According to the activists, the companies which are located in the park have violated environmental norms. Why? Explain briefly. Despite having gone through legal actions and many protests, local residents and supporting social movements did not see their demands beign implemented by the government. A Study on the Perceived Loss of Common Property Resources (CPR) By Thervoy Kandigai Villagers, Thiruvallur District, Tamil Nadu. Multinationals Observatory, Was Michelin involved in human rights abuse in India?